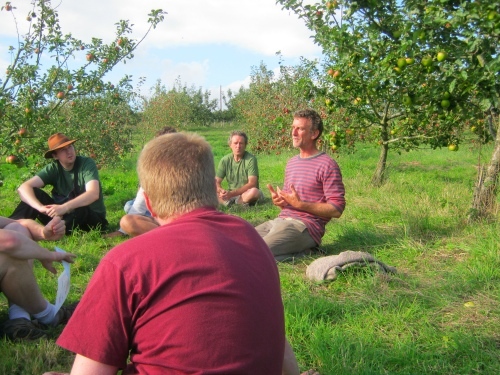 We recently taught one of our permaculture design courses at Ragmans Farm in the Forest of Dean. 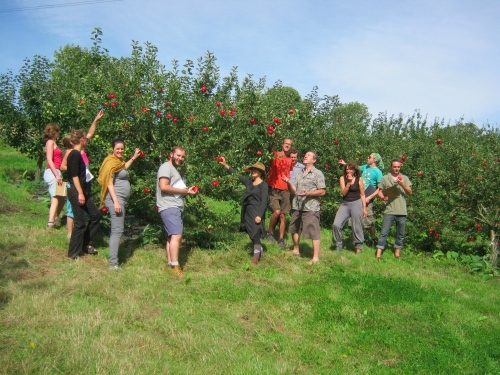 For years they’ve been innovating with permacultural ideas and their latest trend is holistic orchard management. One key to the system is the use of aerated compost tea. This is a preparation of beneficial microbes, made by bubbling air through water to which a small amount of good compost has been added. There are various other optional things you can add to feed the microbes and Peter Kafno, who works on the farm, took us through how he makes compost tea step by step. 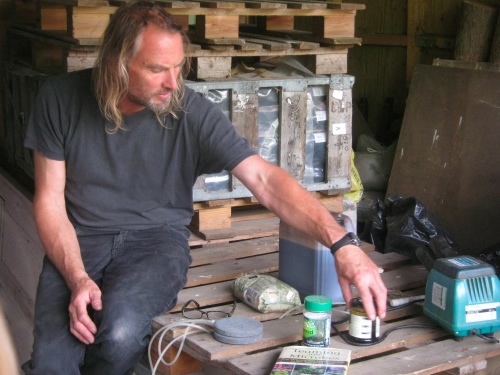 Peter Kafno explains the craft of making compost tea. For complete instructions on compost tea he recommends the book Teaming with Microbes. An important detail, which was new to me and doesn’t occur in the book, is that these days you can’t use mains water. It used to be possible to get rid of the chlorine by leaving it to outgas over 12 hours. But now water companies are using chloramines, which are more stable than chlorine and will not outgas. They will kill the microbes – which is what they’re designed to do, after all – so now you have to use rainwater or spring water. If you have a small garden and are able to make enough compost to dress the whole garden with it every year or two it’s probably not worth making compost tea. But on larger areas, where that amount of compost would be out of the question, it really comes into its own, bringing the biological benefits of compost without the need for masses of material. At Ragmans they spray the orchards around once a month through the growing season. 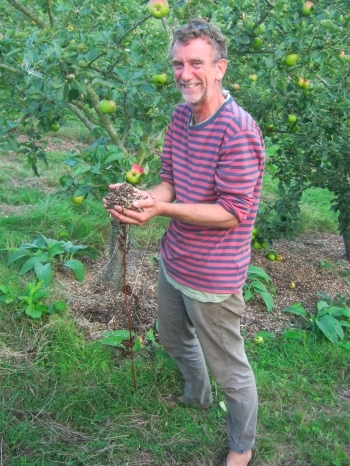 Matt tells us about hoistic orchard management. As well as using the compost tea, they mulch the trees with ramial woodchip. This is woodchip made from small branches and it’s higher in nitrogen and other nutrients than woodchip made from larger wood. It has the effect of encouraging a fungal microflora in the soil, which is beneficial for tree crops, as opposed to a bacterial one, which is what’s wanted for annuals such as vegetables and cereals. One problem is that the fruit is not as visually perfect as fruit sprayed with copper fungicides. There are two solutions to this. One is to educate your customers. Imperfect fruit goes well in a box scheme, where there’s more direct contact between producer and consumer than there is through a shop. The vegetable box scheme at Ragmans is just starting up again now, after a few years in abeyance, and fruit sales will be integrated with it. The other way is to make juice and this is just what they do. 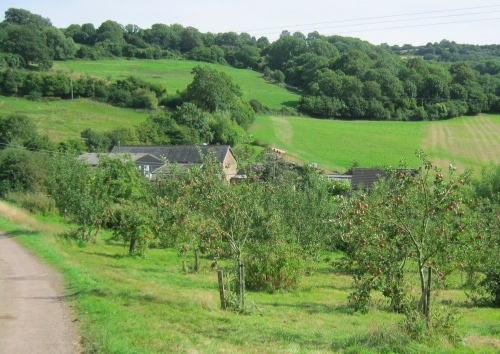 In fact the orchard was originally planted to supply their existing apple juice business.